Light Requirements: High light and will tolerate some direct sun. Best Temperatures: Average to warm conditions. Water and Humidity Requirements: Allow the soil to dry between waterings. Growing Guidelines: Re-pot as needed in an all-purpose soil. Fertilize monthly in spring and summer, while plants are actively growing. Common Problems: Scales and spider mites may find their way to this plant. Propagation: Take cuttings, air layer the stems, or grow new plants from seed. Umbrella trees (Schefflera actinophylla) are evergreen trees native to Australia and New Zealand. 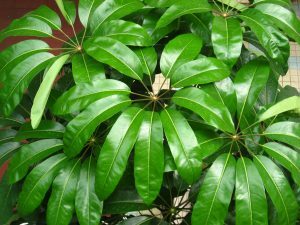 Also called schefflera, they are often grown as indoor houseplants. They are fast-growing, shade-tolerant trees that can invade undisturbed forests and crowd out native species. Umbrella trees grow as tall as 40 feet in the wild, but they usually grow between 8 and 10 feet tall indoors. They have multiple slender, narrow trunks and their shiny leaves grow in circular formations around the leaf stems. Trees grown in full sunlight have been known to produce red blossoms. Small reddish fruits replace the flowers. Umbrella trees grow in full sunlight or partial shade and prefer well-drained soil. They grow in a wide variety of soil types and are moderately drought tolerant. Indoor plants can grow in an all-purpose potting mix. Indoor trees are susceptible to spider mite infestations, while outdoor trees are vulnerable to sooty mold fungus and scale insect attacks. The University of Florida warns that umbrella trees have naturalized in some areas of Florida and are listed as an invasive pest plant species in the central and southern areas of the state. They are also a serious pest species in Hawaii.